2006-08 Renamed this "Linux Screenshots Museum" because these screenshots are now so old, but I don't have time to properly update this. These screenshots are NOT representative of typical modern Linux systems! Taken 19 September 1998. Netscape is viewing a webpage from the web server Apache on the localhost. 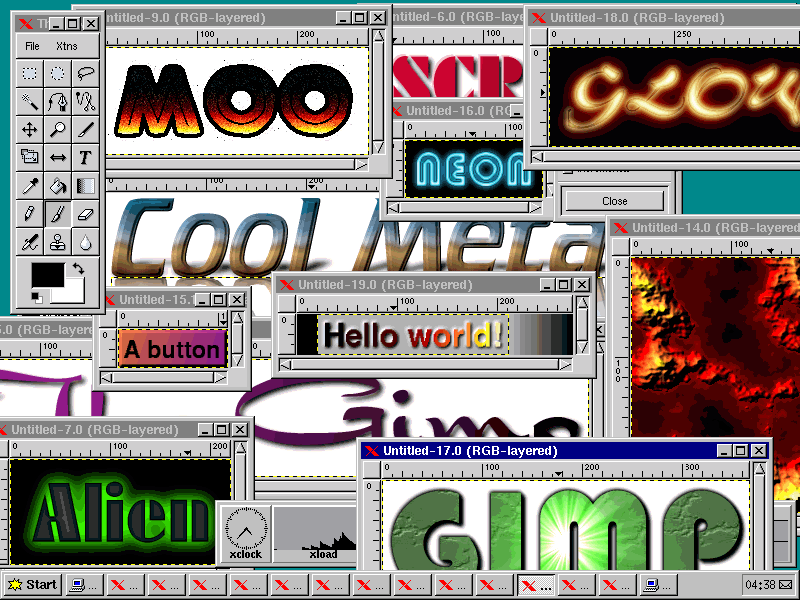 The GIMP toolbar is near the bottom left, which I used to take and save the screenshot. 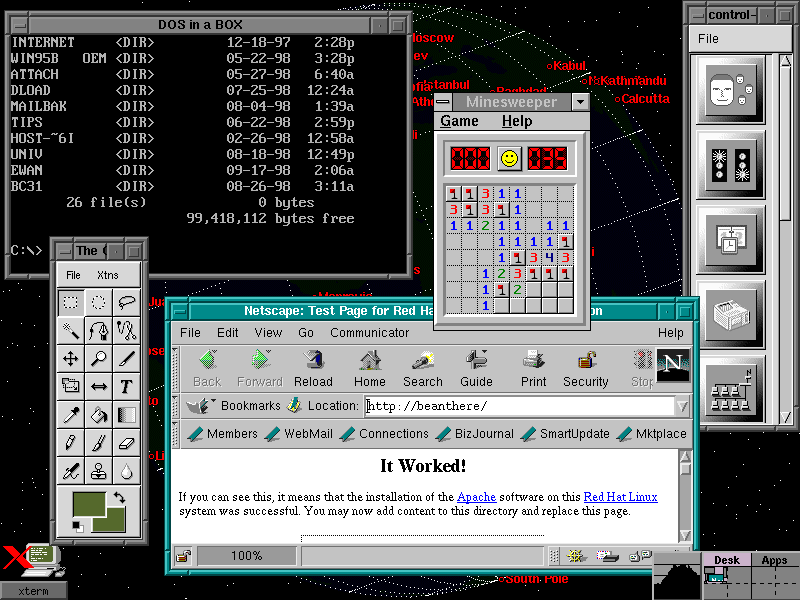 The DOS emulator is busy running DOS in a box, and the Windows emulator is running Minesweeper off my Windows drive. The Redhat control panel is to the right. Xearth is updating in the background, making one wonder why MS makes such a big fuss over 'Active Desktop' when such features come automatically under X as a side-effect of a good system design. My Linux box has all my Windows drives mounted, and using Samba I've made all my shares available to the other computers on the LAN at our hostel. From the other Windows PCs on the LAN my computer looks just like another Windows machine, except that you can telnet into it, login, run things etc, from any computer on the LAN. Taken 23 September 1998. I had just installed the AfterStep window manager. 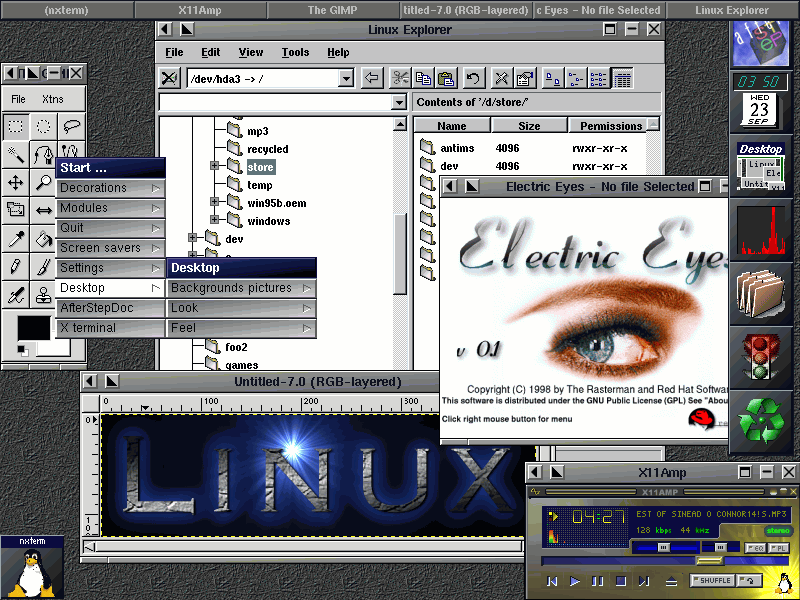 GIMP is there, x11amp is playing mp3's; Electric Eyes is an image viewer/browser that is part of GNOME. The Xplorer is in the background. Taken 29 September 1998. I had just installed KDE 1.0. KDE is great; I would recommend it for a newbie Linux user or a non-technical Linux user. Taken June 1998. This is just a screeshot showing off some of the quick-n-easy effects that can be created with the GIMP default plug-ins. 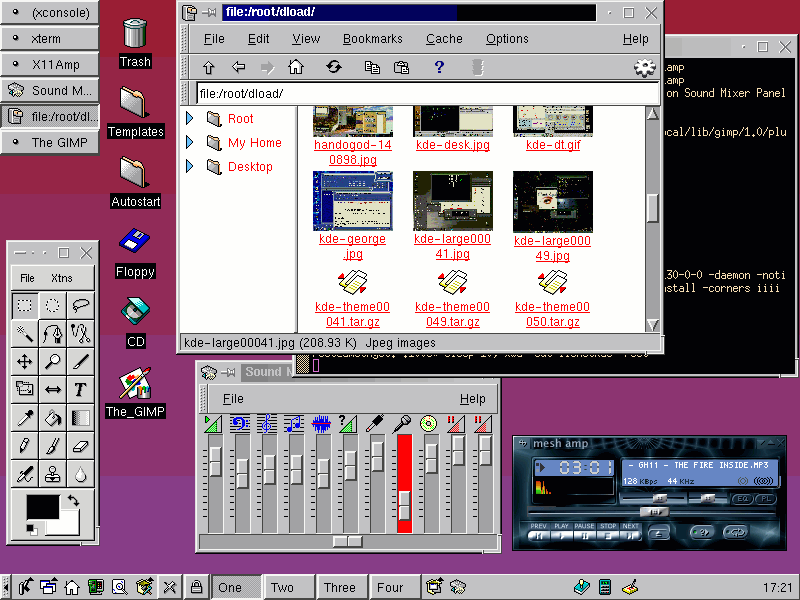 The window manager is fvwm95, which emulates some of the functionality and "look and feel" of Windows 95.